Cyclists and prisoner advocates are organizing a bike ride to aid the large incarcerated population of Louisiana. Called “NOLA to Angola,” the bike ride will raise funds for the Cornerstone Builders Bus Project, a Catholic Charities-supported project. The first annual NOLA to Angola ride will take place October 14-16, 2011. Every month the Cornerstone Builders Bus Project charters a 55-passenger coach-style bus for families of the incarcerated in the New Orleans area to visit five prison facilities around Louisiana, including Angola. Due to the long distance of each trip, the Cornerstone Builders ensure the families will have onboard bathroom facilities and comfortable seats. Each trip costs the church approximately $1,000. Currently, the bus project has no regular source of income, though some trips are underwritten by local sponsors, including church groups and the Jefferson and Orleans Parishes Sherriffs’ Offices. Organizers of the NOLA to Angola Bike Ride hope that their fundraiser will be able to pay for half a year of bus trips. As of September 20th, all 25 rider spots have been filled. However, members of the public who would like to get involved can still sponsor riders or send donations to the project. Donation checks should be made out to: Second Zion Baptist Church Bus Project. Please do not write checks to NOLA to Angola. ABOUT CORNERSTONE BUILDERS: The Cornerstone Builders Bus Project, run out of the Second Zion Baptist Church in Marrero, Louisiana, provides monthly free transportation for families of the incarcerated to visit their loved ones at five Louisiana detention centers: Louisiana State Penitentiary, Dixon Correctional Institute, Tallulah Transitional Center for Women, Avoyelles Correctional Center, and Rayburn Correctional Center. The Bus Project is part of the larger Cornerstone Builders Program that also includes mentoring for children, working to place ex-offenders in AmeriCorps Vista vocational training, reentry counseling for formerly incarcerated persons, networking between businesses run by or willing to employee the formerly incarcerated, and an annual symposium. 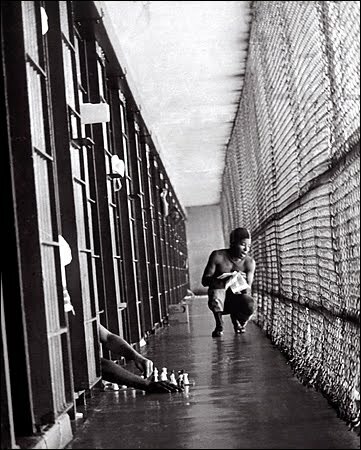 ABOUT INCARCERATION IN LOUISIANA: According to a 2009 study conducted by the Pew Center on the States, 1 in 55 Louisianans is incarcerated in a prison or jail, and 1 in 26 Louisianans is under correctional supervision (incarceration, probation, or parole).2 According to the same study, Louisiana has the highest rate of incarceration of any state (Washington D.C. is ranked higher) in the United States3. ABOUT NOLA TO ANGOLA: Scott Eustis, Elizabeth Lew, Steve Merlan and Matt Toups are New Orleans residents concerned about Louisiana’s high incarceration rate and about Louisiana’s environment. By organizing this bicycle ride, they hope to address both of these concerns, raising money for a crucial service for prisoners’ families while riding pollution-free bicycles across the beautiful South Louisiana landscape. For more information on NOLA to Angola, please visit: nolatoangola.org, or email: info@nolatoangola.org. Photo from Angola by Calhoun Photography studio.